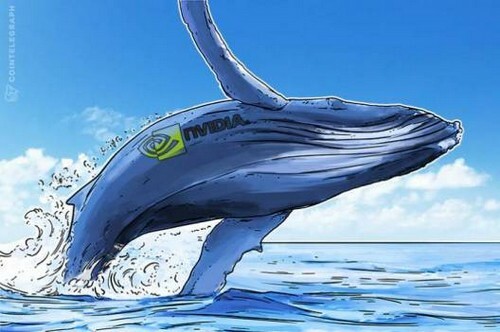 Nvidia (NASDAQ: NVDA), an American graphics processing units (GPUs) manufacturer, has recently reported that the company generated $289 mln from processor sales to the crypto market, Bloomberg reports May 10. This is reportedly the first time Nvidia shared information regarding its revenue from chip sales to the crypto mining market. According to Susquehanna analyst Christopher Rolland, Nvidia’s first-quarter sales from mining hardware were anticipated to be much lower, around $200 mln. Nvidia CEO Jensen Huang explained that they were able to exceed expectations due to increased demand for GPUs from crypto miners, resulting in higher prices. “Crypto miners bought a lot of our GPUs in the quarter and it drove prices up,” Huang claimed, adding that high prices prevented other consumers, such as gamers, from buying into the newest GeForce graphics card series. Nvidia’s first-quarter crypto sales amounted to over 9 percent of overall revenue for the company, which stood at $3.2 bln. Chips for crypto mining made up 76 percent of (Original Equipment Manufacturer) OEM revenue, which was up 115 percent from the last quarter. In manufacturing, OEM components are those, which are made by one company and then used in a product that is marketed by another. Nvidia said in an earnings call that sales to the crypto market will likely decrease by two-thirds in the next quarter. Revenue for miners decreased earlier this year, when cryptocurrency markets underwent a correction following record highs in December 2017. Hashrates have continued to grow however, indicating that the mining pool continues to grow globally. The main competitor of Nvidia, Advanced Micro Devices (AMD) revealed in April that the company generated 10 percent of overall sales from crypto and Blockchain-related sales. The company’s CEO Lisa Su noted the potential of blockchain technology, but stressed that it is not the main growth factor.